New Forums Redesign September 2018! That’s right, another update to the Forums is finally here! Started many months ago, we’re happy to announce a redesigned Forums, with a fresh new look, along with many new features, user interface updates, and performance and security updates. If you recall, we run a platform called Discourse. It’s an open source discussion platform that we started using in June of last year. We rely on Discourse and their awesome in-house and community developers to release new features, while also maintaining the security, performance and issue tracking and maintenance that goes along with running an app/software. We, in turn, take their product, run it on our own servers, and then add our own custom “skin” to it, enhancing the layout and design where we see the need. The most obvious changes you’ll see our visual. We took a lot of the feedback we’ve received from you since the big relaunch last June. A big focus for us this time around was the introduction of more color, less white, and establishing a bit more structure around some of the on page sections and elements. Almost every “page” of the Forums got some attention to bring it into a cohesive design. Hopefully those visual changes come through to you as you make your way around. Along with this redesign, we’re also releasing the next version of Discourse, in this case version 1.9 (We launched with version 1.8 last June). V1.9 brings with it over a hundred changes, with include new features, bug fixes, interface updates, and security and performance enhancements. Some of these you will see first hand (on desktop and on mobile screens), and others you won’t, as they’re directed at forum administrators and moderators. On to some of the features you will see and experience first hand! Discourse is all about replies being disconnected in time and space, but we agree that showing when people are actually replying to a topic is genuinely useful in a variety of contexts. So we’ve added live indicators at the bottom of a topic, and in the composer itself, to let you know when other people are actively replying. 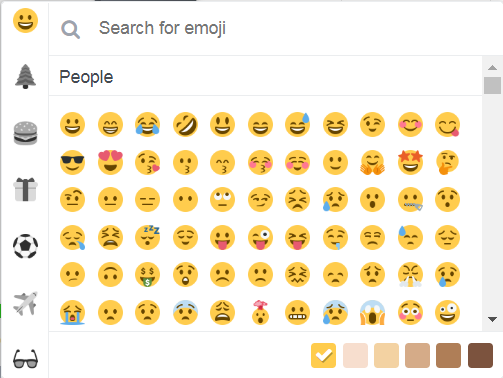 The emoji selector has been completely revamped to support search by typing and skin tone selection. Discourse natively supports basic bbcode, HTML, and of course Markdown. When pasting content into the composer, Discourse willl now attempt to convert what is in your clipboard to native Markdown on your behalf! This should help when pasting in Excel (and clones) tables and other HTML / RTF paste conversions. If you paste a link on a line by itself, Discourse will summarize the link on your behalf — it’s called oneboxing. Discourse improved the default onebox to support more metadata from the link, such as the site icon, the date, and the site title. And now, even if you paste a link that’s not on a line by itself, Discourse will summarize that link for you by pulling the title out of the link. This is called “inline oneboxing”. Again, we hope you like the changes. Give us a shout in the Feedback subcategory and let us know what you think about the changes. We’ll have an officel topic set up for your feedback. If you find any issues, please let us know and we’ll get to work resolving anything that comes up. We now have our forum giveaway winners! Congratulate them here!